His Holiness the Dalai Lama taking part in an interactive teleconferencing event with Dr Paul Ekman and group of scientists on topic “Moving Towards Global Compassion”. Dharamsala: His Holiness the Dalai Lama participated in an interactive teleconferencing event with Dr Paul Ekman and groups of scientists, psychologists and spiritual members in San Francisco, California earlier this morning. Dr Paul Ekman, an American psychologist and a pioneer in the study of emotions and facial expressions co-created the Atlas of Human Emotions Project with His Holiness the Dalai Lama. The theme of the dialogue was ‘Moving Towards Global Compassion’. The live webcast received over 293,000 views on Facebook. His Holiness started off the meeting reiterating a favourite theme and his lifelong commitment: promotion of basic human values. “My friend, Paul knows my way of thinking. I have totally dedicated my body, speech and mind towards the well-being of others”. “Everybody wants a happy life—more calm, peaceful and happy life. For this, the development of the inner world, emotions, is important. I am not referring to religious faith. Our concern is happier individuals and happier communities. We want to promote human values: a sense of caring for each other’s wellbeing. Result: we become more open and our perspectives wider. Speaking to his scientist friend on the other end, His Holiness said, “Your life is very important to promote these inner values. I am just one human being. Regarding promotion of these human values, we should work together.” He added that the audience must also share the responsibility. He also said India is an illustrious example of religious harmony based on mutual respect and understanding. “Look at India, for 3000 years, different religious traditions have been living together harmoniously. besides homegrown religious traditions, there have been so many religious traditions exported from outside and living harmoniously today. “Basis of harmony among different religious traditions is the recognition of our same message and religious brotherhood is possible,” His Holiness said firmly. “One time in Australia, before a public talk, one Christian minister, who has been helping many many poor children. When he introduced me, he described me as a good Christian. When I started my talk, I pointed at him and said, ‘I consider you a good Buddhist’. “There is a reason. We all practice same practice; that is love, compassion, tolerance, and contentment,” His Holiness said, emphasising the same message of all faith. While he opposed violence and war, His Holiness asserted through his talk that there is a nonviolent way—cultivating warm heart and allowing our better selves to prevail. He proposed the need for emotional hygiene and strengthening of positive emotions through education. At the Q&A session, His Holiness told a psychologist that complaining about the negative consequences in our lives is not sufficient. “The best way to prevent conflict is by addressing the causes of these problems. Now the time has come to reduce the causes of human crises, including war”. He said, “Our world should be free of nuclear weapon, then offensive weapons. Weapons are for killing human beings. They are waste of money and also harmful to the environment. We should not repeat 20th century’s experiences of violence. Responding to a question on how to tackle negative impacts of Social media and technology, His Holiness said to use technology more constructively, our inner peace is most important. “These technology created by human beings so we are actually controller; we should not be the slaves of technology. I think technology is quite neutral, no emotion. Whether technology’s effect is good or bad depends on the user. It’s important that we shouldn’t be slaves to technology; it should help us. “If human being become more compassionate and with a wider perspective, then technology can be used in positive ways”. His Holiness thanked the audience for their undivided attention and welcomed further discussions in future. “I am always ready for these discussions from time to time. I always consider myself as one of the 7 billion human beings. From that view, I am also one of you. 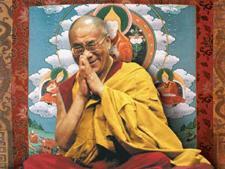 I never consider myself as Dalai Lama or something special so sharing each other’s experience is our duty”. The Tibetan spiritual leader and Dr Paul Ekman has been working on Atlas of Emotions for the last six years. The hour-long teleconference was organised by Dr Tenzin Ravi Varma, President of Tibet House, California and his team.